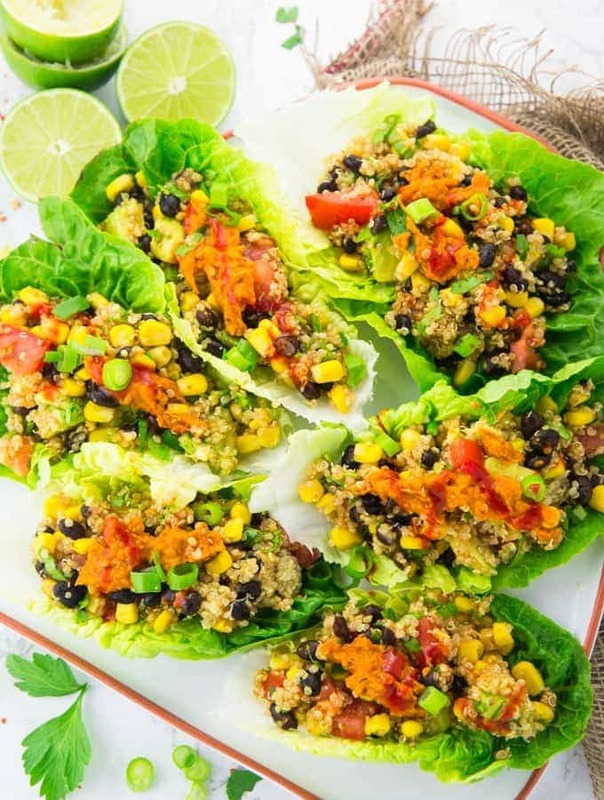 These vegetarian lettuce wraps with quinoa and black beans are perfect if you’re looking for a healthy meal. They’re super light, extremely healthy, vegan, and pretty easy to make! Top them with a little bit of sriracha for extra spiciness! I LOVE wraps! They make such an easy and delicious lunch. And why not just use lettuce instead of tortilla wraps once in a while?! This makes them even healthier and it’s just as easy. I usually use Romaine lettuce for these vegetarian lettuce wraps, but you could also use collard greens or kale instead. 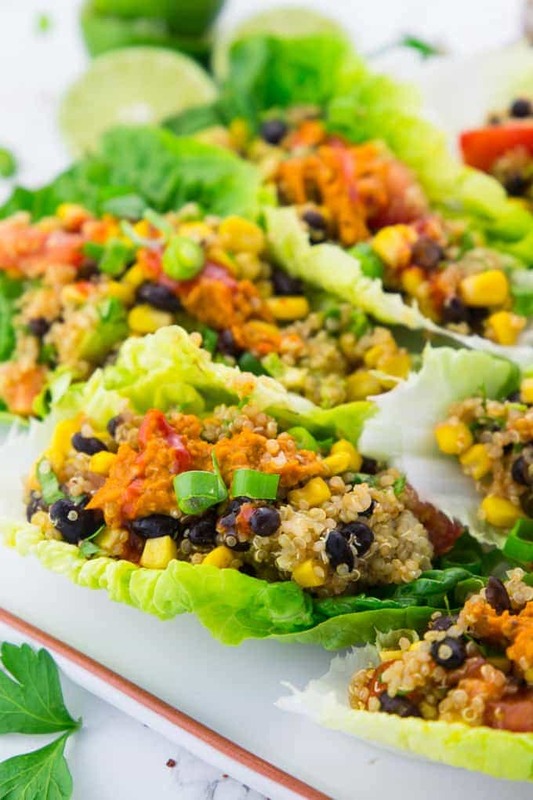 In combination with quinoa and black beans, these vegetarian lettuce wraps are SUPER HEALTHY and packed with protein. And I also added chopped fresh parsley, which is very rich in iron and perfect for vegans and vegetarians. The ingredient list for these vegan lettuce wraps isn’t too long and you’ll find all of the ingredients in a regular grocery store. As always, you can find the full ingredient list and the recipe instructions in a separate recipe box at the end of the text section. Which lettuce is best for lettuce wraps? Iceberg lettuce, romaine lettuce, and Boston lettuce all work pretty well for lettuce wraps. Among these three kinds of lettuce, Romaine lettuce is my favorite! 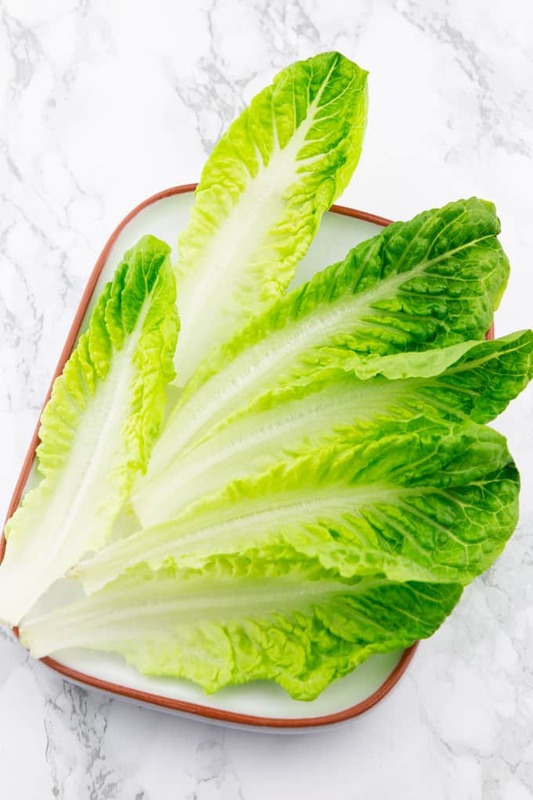 Romaine lettuce has not only the perfect-sized leaves for lettuce wraps, but it’s also pretty good for you. For example, it’s a great source of dietary fiber, vitamin C, and iron. It also contains magnesium and calcium. The recipe for these vegan lettuce wraps couldn’t be much easier. All in all, the lettuce wraps are ready in about 20 minutes. STEP 1: Start by cooking the quinoa. I usually cook quinoa in the Instant Pot. This way, it’s ready in about 10-12 minutes. However, if you don’t have an Instant Pot you can also just follow the instructions on the package and cook your quinoa on the stovetop. STEP 2: Rinse and drain the black beans and the corn. In a medium-sized bowl, combine the black beans and the corn with the quinoa, lemon juice, paprika powder, cumin, and chopped parsley. Season with salt, pepper, and red pepper flakes. STEP 3: Equally fill the quinoa mixture into the lettuce leaves and top them with some hummus, green onions, and if you want some sriracha. Enjoy! I topped these vegetarian lettuce wraps with a white bean spread with tomatoes, but you can also use hummus instead. Hummus with roasted red pepper would work really well. Or maybe some sort of spiced hummus. If you want them to be a bit spicier, you can also add some sriracha on top. Or you could also add some red pepper flakes to the quinoa black bean mixture. You don’t like quinoa or you’re out of it but still want to make this recipe? Then you could use brown rice instead. It’s also a great combination! If you want to bring the lettuce wraps to work or school, just transport the filling and the actual lettuce wraps in two different containers. When you’re ready to eat, just spoon some of the filling into the lettuce shells. This way, you will avoid any possible mess and the wraps are easier to eat. Here are some more ideas what you could put into your lettuce wraps. I hope you like these vegetarian lettuce wraps as much as we do around here. These vegetarian lettuce wraps with quinoa, black beans, and corn make such an easy and healthy meal. One of my favorite vegan recipes for lunch and dinner! They're super healthy and packed with protein. So light and easy! Rinse and drain the black beans and the corn. In a medium-sized bowl, combine the black beans and the corn with the quinoa, lemon juice, paprika powder, cumin, and chopped parsley. Season with salt, pepper, and red pepper flakes. Equally fill the quinoa mixture into the lettuce leaves and top them with some hummus, green onions, and if you want some sriracha. Enjoy! You don't like quinoa or you're out of it but still want to make this recipe? Then you could use brown rice instead. It's also a great combination! If you want to bring the lettuce wraps to work or school, just transport the filling and the actual lettuce wraps in two different containers. When you're ready to eat, just spoon some of the filling into the lettuce shells. This way, you will avoid any possible mess and the wraps are easier to eat. I have found your recipes to be quite good. I only wish your page was easier to navigate. I have printed they recipe for wraps and as I type the ads are still loading. I have learned not to close the banner on the bottom of your page before I have navigated to the printable recipe, or scrolling is very slow and jerky. I have no problem with you earning money, but ease of use is something that I value. If I didn’t care I wouldn’t comment. I am using Chrome browser, is this the problem? My computer is not that old. Is there something that either of us can do to make your page easier to use? She’s not going to put less ads on the page. She will make less money. If you don’t like it the only thing you can do is use ad block. Yay!!! I was so happy to see this! My husband and I are trying to eat better so we decided to go vegan. So coming up with new things to try is becoming harder. What a wonderful dinner. I made some slight changes, added a few more veggies, some cucumber and carrots and to top it off avacado and pickled ginger. I was thrilled with the end result. Thank you for your help it was much appreciated. These turned out so delicious! Perfect when you want to eat healthier and avoid carbs!